Today, we are going to share with you how to find your best friend , Mr. best dive computer. This complex and reliable friend will do all the difficult dive table calculations real time for you while you enjoy the breathtaking scenery of the ocean, making your time underwater like a walk in the park. 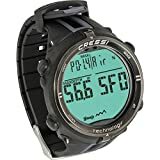 Finding the best dive computer that matches your needs is not an easy feat due to the sophisticated technology and many features available. Most people will get overwhelmed, especially this is your first time looking for your best dive computer. Aqua Junkies is going to make your life much easier when it comes to choose your s﻿﻿cuba gear, starting with getting you your best matched dive computer. Now, Iet's get familiar with the dive computer and find your best friend that is right for you. Thank you for visiting Aqua Junkies. We've done our best to provide you with the most in-depth consumer guide with honest and accurate information relating to the best dive computers currently on the market. A significant amount of time has been invested in providing you with this information, so We do hope you find it useful. Most Recommended: If you haven't got the time to read our entire buyer's guide then I would suggest that you check out our editors' choice, Shearwater Research Petrel 2 , which we recommend because of its Trimix Capable, Large Display Screen, User-Friendly with Digital Compass. Additionally, it allow Bluetooth Integration. All the features that you need for your advanced recreation or technical dives. 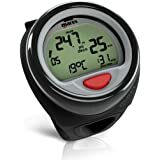 How To Choose The Best Dive Computer? What Are The 6 Benefits of A Best Dive Computer? How To Take Care of Your Dive Computer? Each month we update this section with the best recommendations within various price brackets and also include the best dive computer deals currently on the market, check out below for this month's recommendations! 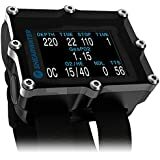 View the best dive computers under $1000 & above $500! View the best diving computers under $500 & above $200! 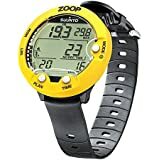 View the best dive computers under $200! After spending numerous hours on finding the best dive computers, these are our shortlisted dive computers that deserved some mentions at AquaJunkies. First of all, you will need to consider what kind of diver are you? Are you a new diver that can't wait to start your dive adventure? 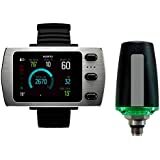 or Are you an experienced diver who need to have a better dive computer that matches your current needs? Remember, it's about choosing the best dive computer that matches your needs. For beginners, I would suggest that you get a simple dive computer, that is easier to use that comes with a large display screen. As a beginner diver, you will probably be busy with getting comfortable breathing and swimming underwater than figuring out your sophisficated dive computer. Don't worry too much about outgrowing your dive computer, it will serve as a great backup in the future once you becomes an advanced diver. For advanced recreational and tech divers, you requires much different sets of features such as trimix capabilities which is important to you. The dive computer's screen should be easy to read. Things to look out for are big numbers, backlit displays and high contrast colors. 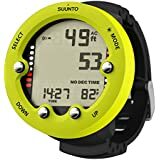 The Suunto EON Steel is a popular choice among divers for its large wide angle BrightSee display color screen. How do you know if a dive computer is user-friendly? A simple test is to start fiddling with it and quickly familarize with the features without the need to read the dive computer's manual. Configuring and shifting through the modes should be straightforward and easy especially underwater. You don't want to waste time navigating through the modes. Make sure that the mode buttons are big enough for your gloves under cold water condition. You want to be able to press the right buttons. There are plenty of entry level dive computers that offers all the modern features which are usually for new divers who just started to enjoy diving, and don't have a big budget. For a basic dive computer, you are looking at a range of $300 to $500. For more advanced dive computer packed with features will cost you around $800+. Some of the advanced features are air integration, multi-gas capability and digital compass. When it comes to dive computers, there are two different designs available. Either a wrist design or a console design. The advantage of a wrist computer is facilitating easy access to all the important dive data on your arm, making it easier to read. There are two styles of wrist computers, the classic style and the normal watch style. The classic style is slightly larger than the normal watch style. As the normal watch style is smaller, it is slightly more expensive than the classic. Divers who are looking to have all the dive data, instruments in one device should look at a console computer. It is common to find a console version of the wrist computer models in the market. The current trend in the dive computers market is having wireless air integration. Wireless air integration allows you to monitor your air consumption on your computer with the use of a transmitter. Top models even allow you to monitor the remaining air of a whole group of divers which is definitely a great addition for technical dive teams. If you thinking of replacing submersible pressure gauge (SPG) with this cool new feature, it may not be a wise decision as the technology is still not perfect. The possibility of a lost signal to the transmitter is still remotely possible. You will still need you trusted SPG when you are 150 feet below the surface. Stay safe always. 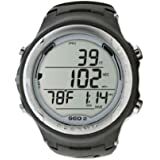 If you are considering getting other big ticket scuba gears such as BCDs and regulators, I will suggest that you get a package deals to save a lot of money and Amazon is a great place to source for such deals. As of all package deal, you may not be able to choose each individual gear that is best for you but at least you get most of the gears you want and save lots of money. Some people love such package deal and others prefer to have the choice of getting the best gear for themselves. Either way, it's worth to take a look first. Who's know? There could be the best package deal for you. Some of the most popular packages, that you can consider are ScubaPro Equator Package, Aqualung Axiom Package and Cressi Travelight Package. Dive computers allow divers to have more time underwater on multi-level dives. This is possible because a dive computer is able to provide a much accurate dive profile compares to a dive table which provides a square profile base on depth. Most dives do not have a square profile as the nitrogen in-gassing rate changes as you change your depth. A dive computer is able to constantly recalibrate your maximum dive time of evaluating your current depth, the in-gassing rate at that depth, and current nitrogen levels. With dive computer, no-decompression limits are calculated automatically for you. This eliminates any human error that happens with dive tables. Dive computers help divers to avoid decompression sickness using the same theories dive tables are based upon on the theoretical uptake (in-gassing) and eliminate (out-gassing) of nitrogen within a diver's body. Dive computer tracks it real time and you can enjoy your dive better without worrying about it. One of the biggest challenge that divers faced while underwater is to determine an accurate maximum depth and bottom time. These data are often recorded inaccurately. Dive computer eliminates these inaccuracies and provides a safe diving experience. Divers are taught to respect the maximum ascent rate and never to to exceed it. Ascent rates vary in a range of between 30 and 60 feet per minute. Exceeding a proper ascent rate may result in decompression sickness which you don't want to be in such situation. Dive computer allows a diver to monitor control his or her ascent rate within the safe limits and provides a safer dive experience. You no longer need to document your dive profile immediately after each dive. All this critical information are stored in the dive computer for easy access and can be useful when you records your dives in a logbook days later. Air integrated dive computers offer divers an added advantage. In addition, it provides accurate cylinder pressure and air time remaining information while accurate basic information on depth, time, decompression status are still monitored. Most divers, even the experienced ones are not able to accurately estimate how long their air supply will last at different depths and under various diving conditions. Novice divers with the lack of experiences will have a more difficult time to do their estimates. The SPG does not help to improve this situation as well as it does not offer information on how long a diver's air supply will last at various depths, the types or sizes of cylinders or under different dive conditions such as strong currents. Air integrated dive computers help to fill in the gap with accurate information on how much time a diver has left underwater based on the consolidated data and signals which make diving safer and preventing any out of air emergencies. Now you have overcome the hurdles to get your best dive computer online. The next crucial steps are to take care of it. You want to make sure that it last throughout your diving journey. The first step is read the instruction booklet. I know instruction booklet are boring and most of the time, nobody really read it page by page. I usually skip to the important pages or prefer fiddling or playing with the dive computer. The objective of this first step is to make sure all the buttons and each function of the dive computer is working. Thereafter, you can set your time and date, metric or imperial, fresh or salt water, etc. After every dive, make sure that you rinse your dive computer in fresh water as soon as possible, notably the display. Keep it out of direct sunlight. This is to protect it from being damaged. Store it in a cool, dry place. Lastly, perform a routine change of battery or recharge schedule for your dive computer as recommended by the manufaturer. The Cressi Leonardo Scuba Dive Computer is suitable for beginner divers. It comes with a single navigation button and has large digits. The Suunto Zoop Novo Dive Computer is suitable for new divers or function as a back up computer. It has 4 button modes and large digits. The Suunto Vyper Air Dive Computer is suitable for advanced recreational and tech divers. It comes with an electronic 3D compass with adjustable time out. 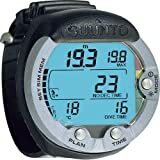 Suunto Eon Steel Dive Computer is suitable for all levels of divers. Most advanced recreational & tech divers would like Suunto Eon Steel for its extensive features that cover all option. Rechargeable Lithium-Ion Battery, Up to 40 Hours of Dive Time. The Oceanic Geo 2.0 is suitable for recreational divers who has a budget in mind and prefer a watch style design. Shearwater Research Dive Computer is suitable for advanced recreational, tech divers & rebreathers. It's sleek and durable design comes with easy 2 button navigation interface. 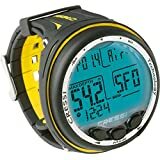 Cressi Giotto Dive Computer is suitable for recreation divers with affordability in mind. Varieties of colors are available for selection. Cressi Newton Dive Computer is suitable for recreation divers and tech divers. It has the storage capacity of 70 hours dive. 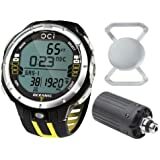 The Oceanic OCI Dive Computer is suitable for free divers & advanced recreational divers. It has a wireless transmitter feature. The Suunto Zoop Wrist Dive Computer is suitable for new divers or function as a back up computer. It has 3 button interface and large digits. The best dive computer is going to be one of your most trusted buddy throughout your entire diving adventures. 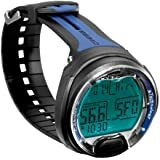 It calculates and crunches real-time dive data for you, monitor your dive profile, increases your dive time underwater and some of the advanced computers even allows you to have wireless air integration. Below are some of Aqua Junkies favourite dive computers and it may be yours as well. approx. 2 Years Average Life (50 yearly dives) dependent on usage, storage and temp etc. No divers share the same dive profile. Each diver in a team must have a separate dive computer. Different dive computer may results in different remaining dive time. Always choose the most conservative limit.